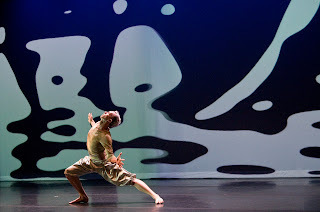 Dance Commentary by Heather Desaulniers: "Light Moves"
"Light Moves", the newest piece by the Margaret Jenkins Dance Company, premiered last night to a packed house at San Francisco's Yerba Buena Center for the Arts. A collaborative project, featuring choreography mixed with video, text and an original music score, this evening-length work celebrates the best of today's modern dance scene. During the seventy-minute physical journey, the primary theme was very clear: never-ending, constant motion. Fans of Jenkins' work were treated to many different sides of this brilliant choreographer: her artistic strengths shone and new choreographic interests were revealed. As the curtain rose, the company entered in a tight-knit group from stage right already in the midst of a movement sequence. This gave the impression that the piece had started long before the lights went down - the audience may have thought that they were watching it from the beginning, but in fact, they were witnessing something already in progress. Utilization of the wing space was a theme throughout "Light Moves" and a major contribution to the work. So often the wings are relegated to the obvious: entrances and exits. Here, the wings were an extension of the performance and included some stunning choreography. My favorite was a recurring walk where the dancers came out of the wings already engaged in a circular pattern that included upper body curves and sternum lifts. Jenkins' approach to interdisciplinary performance was and is a sight to behold. She clearly values collaboration (and a variety of types), but it is her treatment and direction of these multiple elements that really enchants. The components of "Light Moves" were engineered in such a way that they could peacefully co-exist, without competing for attention or overpowering each other. And, because there wasn't too many things happening all at once, the dance could literally take center stage. Choreographically, "Light Moves" combined Jenkins' signature staccato work alongside slow, lush divertissements, providing wonderful and contrasting dynamic change. These latter scenes allowed suspended luxuriation, without the movement passing by so quickly. Particular noteworthy examples were the soft, supported jumps, calm fouettés, Ryan T. Smith's rond de jambe to parallel 2nd and Steffany Ferroni's relevé long in arabesque. Another unique choreographic tool is Jenkins' cluster sequences. She creates a human puzzle where the entire cast is visually and physically compact. The movement and levels are varied and performed full out without looking claustrophobic. I saw a preview of this dance last October at the San Francisco Jewish Community Center and was heartened by one significant improvement in this premiere: the women's performative range. At the earlier viewing, the women only had one level of expression: angst-ridden seriousness. At times, they looked so pained that it was distracting from their technical achievements (with the exception of Steffany Ferroni who did not fall victim to this trap). Last night's performance saw a diverse spectrum of expression and emotion from all of the women. The angst was still there but it was appropriately placed and interspersed with equal amounts of joy and playfulness. I do think that this company is going to have to deal with its technical variance fairly soon because, unfortunately, it is starting to come across onstage. Also, "Light Moves" is a little too long. There was a beautiful moment near the end where the text was scrolling up the hanging screens and Margaret Cromwell knelt, intensely watching it. This had all the characteristics of a final moment, where the credits roll. It was a natural ending point, and so, the dance that followed was a little disconnected and came across as a bit of an afterthought.